With a big history unit coming up in Term 1 for the 5/6 teams, I’ve become a bit obsessed with making History timelines. I’ve already reviewed Meograph earlier this year and posted my multimedia Meograph timeline on Australian History for your viewing. I’ve since discovered a simpler, more linear and cutback timeline creator that I can see having both advantages and disadvantages over Meograph. I see myself using both for different reasons. Preceden Timeline Maker has been around since 2010 but this is the first time I have discovered it. Unlike Meograph, which is more of a multimedia storytelling tool with timeline capabilities, Preceden is very much a timeline first and foremost. As you can seen from the annotated screenshot above, it has an easy to follow layout that presents as a clearly labelled timeline of events. The timeline consists of layers and events. The layers are a good way of categorising the events, especially useful when dealing with an historical period with many different themes. The layer titles are placed at the beginning of timeline left of screen but stay anchored and visible as you scroll across the timeline. Events can be colour coded, either automatically or manually. If the event is a particular moment in time, it is represented by a coloured dot placed along the timeline in the date/time zone it belongs to. If it is an event that lasts over a period of time, it becomes a coloured horizontal bar that stretches across the timeline from starting date to finish date. 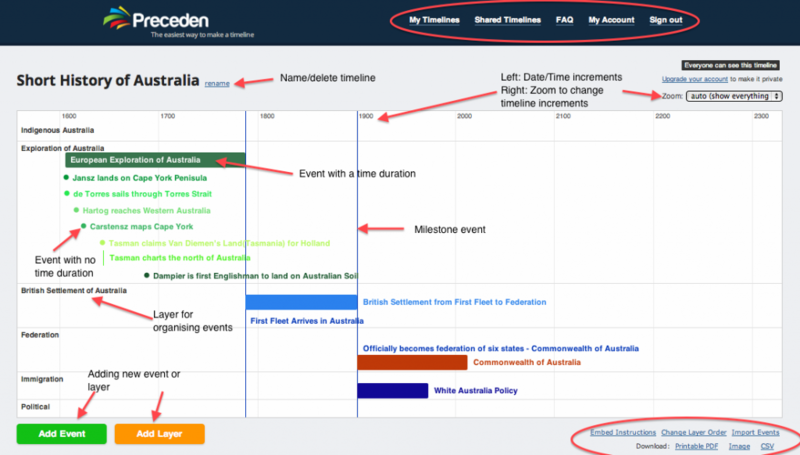 Each event occupies its own vertical space so as you add more events, the dots or bars fill the page from top to bottom. If the event name is short enough, it fits inside the bar but if it is longer than the bar duration, it is located to the right of the bar. By allocating each event to its related layer, the events appear in that specific section. If you designate the event as a milestone, a vertical line stretches from top to bottom, acting as a visible dividing line between other less significant events. At first glance, Precenden appears to lack multimedia functionality, with the emphasis on the timeline itself. Images and links, however, can be added ( which I’ll describe later) and they can be viewed by ‘mousing over’ the event, appearing as a temporary popup box. Any notes you add for detail also appear in this pop up box. In the top right corner, you will notice a zoom feature. This is a useful feature that alters the appearance of the timeline. You can zoom in or out of the timeline from as accurate as seconds to as wide ranging as 10 billion years, meaning you can represent any time period in historical records. There is also the auto function which fits the whole timeline to your viewing window. At the bottom on the right hand side are other functions worth noting. First, there is the embed instructions, which will take you to the embed code so that you can embed your timeline into your own website or blog. Note that the embedded timeline. as you’ll notice in my example below, only presents the timeline itself – the popup info window does not work in embedded timelines, nor do you see the event list. You should include a link to the original for full viewing. It should be noted that any changes that you make are automatically updated in the embedded timeline.There is also a option to rearrange the layer order, through a simple drag and drop UI. There is a function for importing CSV files (instructions included) so that you can create data in a spreadsheet offline, then import for visual publication. You also have PDF, Image and CSV export options. One final option to note is the Rename function. While not obvious, this is where you will find the delete option if you want to get rid of your timeline. Obviously, it is also where you can edit the name of the timeline. When you add an event the dialog box below appears. Here you input the name of the event and have the option to alter the colour of the dot, text or bar with the popup colour editor to the right. A preview is shown directly below the text. Next you allocate a layer to the event and enter the start and end times. 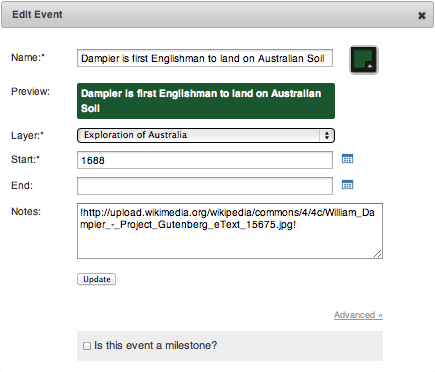 Finally, there is a Notes box where you can enter additional information about the event, insert an image or hyperlink. 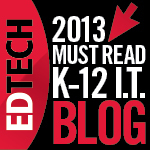 Images can only be inserted from the internet – you can’t upload images to the program. Read the FAQ section for instructions but basically you copy the link to the image from its original website location ( it should be Creative Commons or your own images only) and insert exclamation marks before and after the URL ( as seen in the example above). To insert a hyperlink, you use other simple code, again described in the FAQ section. It’s a bit clunky but simple enough once you get the hang of it. The final function in the event dialog box is the Advanced feature, which gives you the option to make the event a milestone, as described earlier. As well as the timeline itself, a list of ordered events is also published below the timeline, as seen in the screenshot below. This is where you can easily view the images, the information about the events and access the hyperlinks without mousing over the timeline. It is also where you access the editing features and bring up the event dialog box to make any changes. While I am obviously impressed with the multimedia ( audio narration, video/image, map, timeline) features of Meograph, I also like the simplicity and timeline focus of Precenden. I am particularly impressed with the control over the timeline ranges from seconds to billions of years. This makes it useful for a lot of time based Mathematics possibilities as well as the usual History emphasis that timelines get used for. It also makes it easy to compare the duration of different events and put time periods and events into perspective, when comparing, for example, the 100 years war to the First Gulf war. the life cycle/span of a turtle compared to a fly or the time frame of human existence compared to the whole of Earth’s existence. It works on an iPad for creating. The scrolling and mouse over viewing functions don’t though. I can see a lot of benefits to Preceden and can see myself using it in a lot of curriculum areas in the future. Give it a try and let me know what you think. 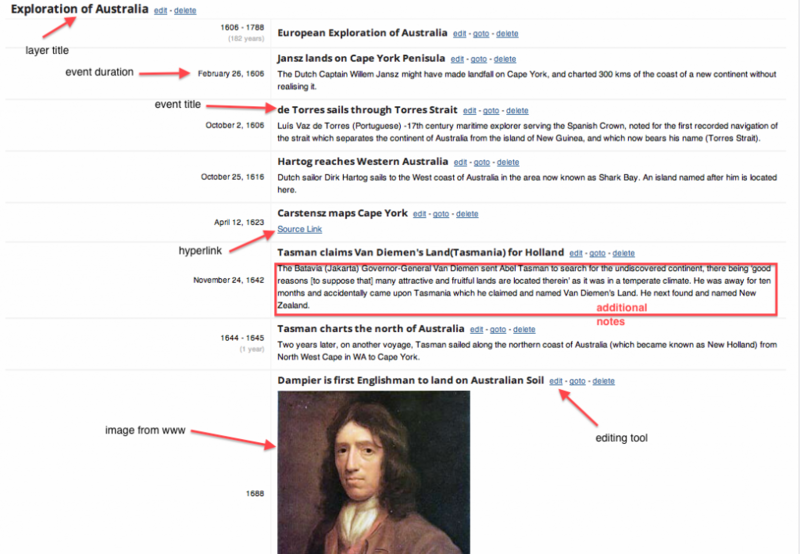 Below is an embedded view of my incomplete History timeline to show you how it looks embedded in your blog, You can view the full timeline here to see how the mousing over, zoom and scrolling works.